Food for fuel • State's first anaerobic digesters, under construction in North Salt Lake, are to save landfill space and cut greenhouse emissions. | Courtesy of Wasatch Resource Recovery Rendition of Utah's first anaerobic digester for turning organic food waste into renewable fuels. Officials broke ground on the new facility Thursday. Al Hartmann | The Salt LakeTribune Utah Gov. Gary Herbert, center, (no hat) break ground with members of Wasatch Resource Recovery, ALPRO Energy & Water, Alder Construction and South Davis Sewer District, to build a facility introducing Utah's first anaerobic digester for organic food waste, a process that converts organic food waste into renewable resources. The plant will be in North Salt Lake. 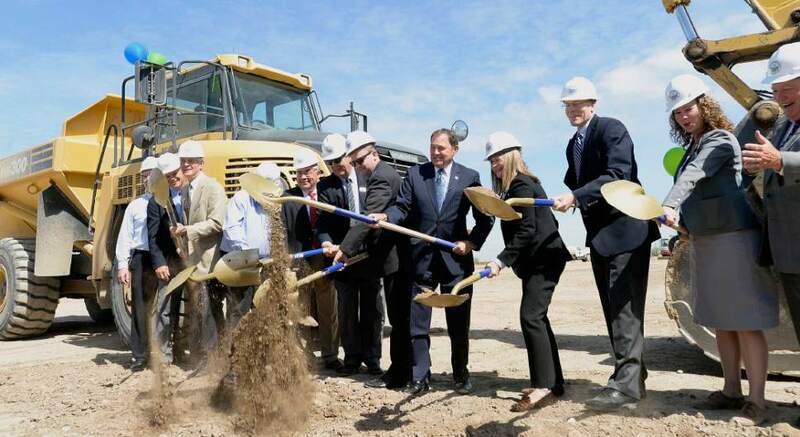 North Salt Lake • State and local officials broke ground for Utah&apos;s first food digester Thursday morning in a project aimed at reducing landfill waste and harnessing unused renewable energy. The North Salt Lake facility, to be opened in late 2018, will deploy anaerobic digesters to grind and liquify food waste, then use water, heat and bacteria to convert it into methane gas to be used as natural gas and bio-solids to be converted into fertilizer. The project, called Wasatch Resource Recovery, is a cooperative partnership between Salt Lake City-based ALPRO Energy & Water and the South Davis Sewer District and will enlist Utah businesses statewide to send their food waste to the facility. Officials hope the digesters will save landfill space, reduce greenhouse emissions from buried organic garbage and give businesses an affordable alternative for disposing of their food waste. "We wouldn&apos;t take a barrel of oil and bury it and we are essentially doing the same thing with our food waste," said Morgan Bowerman, recovery resource and sustainability manager for the site. "When we are wasting that, we are wasting massive amounts of a resource we can use. Food waste will always be a byproduct, why not use it?" About 40 percent of food produced in the United States is wasted, according to the U.S. Department of Agriculture. Nearly all of it ends up in landfills, and the U.S. Environmental Protection Agency reports food waste taking up about 30 percent of landfill space. Once at full capacity, the Wasatch Resource Recovery digesters will produce enough natural gas to continuously supply a city of 40,000 people – about the size of Bountiful. 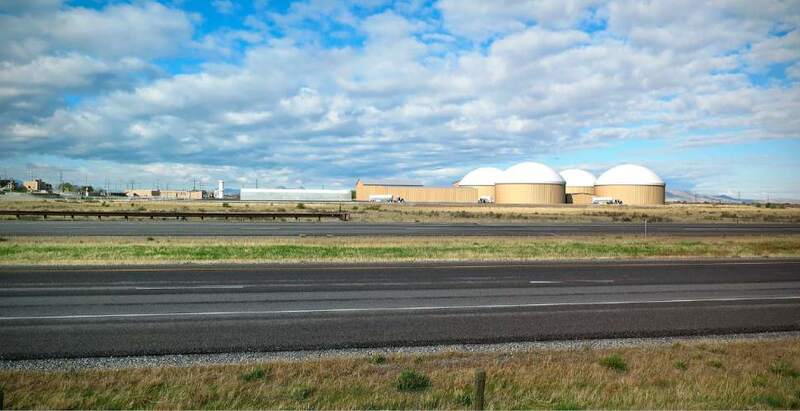 BP Energy Corporation will purchase natural gas created at Wasatch Resource Recovery, Bowerman said, and the solids used in the digesters will be marketed to the agriculture industry. At Thursday&apos;s groundbreaking for the $43 million project, Gov. Gary Herbert said food-waste recovery efforts offer an answer to key challenges a growing state like Utah faces. "These things are not incompatible. We can have sustainable, affordable and cleaner energy, and technology and innovation is driving that opportunity," Herbert said. "The Wasatch Resource Recovery is a prime example of that coming together and see a new way of doing things." In development for about five years, the facility will be housed and managed at the South Davis Sewer District in North Salt Lake, with the help of ALPRO Energy & Water. Two 2.5 million gallon digesters will be built by fall of 2018 and another two shortly after, Bowerman said. The sewer district will manage its around-the-clock operations, which are similar to wastewater treatment. Although the first digesters are more than a year away from accepting and processing food waste, businesses across Utah such as Swire, a producer and distributor of Coca-Cola products; Harmons Grocery; and Utah Food Services Catering have already signed on. Officials said any business across Utah producing organic food waste can participate, including restaurants, hospitals, hotels, conference centers, breweries and food manufacturers. Food items ranging from fats, oils and grease to unused or uneaten food and even foods still packaged such as yogurt and milk can be sorted for digestion, Bowerman said. Officials said businesses will work with their commercial trash haulers, Wasatch Resource and ALPRO to develop a network of separate food waste dumpsters that will be hauled to the digesters. Although some Utah landfills already collect and convert methane into electrical power, Bowerman said, capturing the gas from garbage dumps is only 50 percent as efficient as generating it in digesters. Disposal costs will also be much lower than typical trash removal, she added, reducing costs for food-waste disposal by about two-thirds.